Københavns Golf Klub or the Royal Copenhagen Golf Club as it is sometimes known, is located in the centre of Dyrehaven, which is only a twenty-minute drive north by car from the Danish capital. 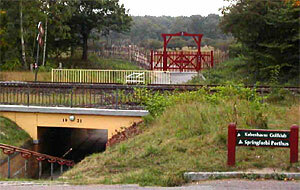 Founded in 1898, København is the oldest golf club in Scandinavia and since 1899 the layout has been routed across part of the unique Dyrehaven nature reserve. 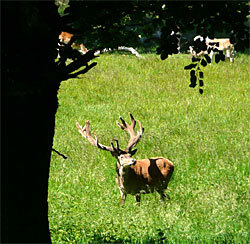 For more than 200 years, Dyrehaven has been a hunting estate and, naturally, there are deer to be found here at Kobenhavns, along with many mature trees in this forest-like setting. The hand of an unknown architect designed the present course back in 1928 and seventy years later, Frederik Dreyer refashioned it. More recently, Tom Mackenzie of Mackenzie & Ebert Ltd was called in to update the layout and Tom has kindly written the article below. Royal Copenhagen is an immensely popular club with some 1,000 members, it's also very appealing to visiting golfers but the club requests consideration for the other sporting guests who usually frequent this delightful sporting estate on horseback. We can all debate the pros and cons of different courses and what weight certain characteristics should have compared to others in creating the ranking. My own preference is overall gut feeling and based on that I believe that Københavns, or Royal Copenhagen is one of the truly magical places to play golf. So much about the place is incomparable. I love the fact that you park in a public car park outside the Dyrehaven and then walk under the railway through giant red wooden gates to be greeted with no real idea where the golf is. A small stone and a narrow path mark the way to a distant wooden and typically understated clubhouse, set in a corral of fences to keep the deer out. Gradually, the golf emerges on the five-minute walk from the car park, with the practice range and slivers of golf amongst the tall grass and parkland trees. As atmospheres go, this is just about unbeatable in my view and is a major contributing factor to why this is such a magical place to play. Add to this the ancient deer grazed grassland and the absence of the usual tasteless tat that litters most courses and things get even better. They have no litterbins, seats or signs, just the simplest of tee markers, flags and bunker rakes. Moving on to the golf. Back in 2005, the board of the Club realised that their course was tired and that work was required to refresh the challenges that it once posed. We carried out a course audit for them that concluded that all of the bunkers should be renewed and/or relocated and that the green surrounds should be reshaped and regrassed. The strict royal park regulations meant that it was extremely difficult to change the routing and even without this, the permissions process was long and difficult. Eventually, all of the work began in September 2008 with Phase 1 completed by Christmas of that year. Phase 2 resumed in August 2009 and was completed by October 2009. In all, every tee, every bunker and every green surround have been revamped. The thrust of the redesign work was to test the better players more without punishing the average club player unduly. Drive bunkers were moved up and greenside bunkers brought into the line of play more. Greens were extended to create more variety of pin positions and old green sizes restored by adjusting the irrigation system and improving surface levels. From our point of view, we are delighted with the results, but it is for others to decide what they think. On an environmental front, it is a great example as well. Ecologically, it is top class with its protected ancient pasture and herd of deer, but socially it is also good with the whole park being used by horse riders, cyclists and walkers alongside the golfing activities. It is a club with a light touch on the environment. That alone is worth a lot in my book.